One of our two native species. Dry sandy or rocky banks (both grassy and forested), meadows and pastures, oak savanna. Quite disjunct on rock on the Keewenaw Peninsula. The similar Myosotis macrosperma Engelm. is known (rare) from the Lake Erie region of Ontario and Ohio, although primarily a species of farther south. It differs in larger nutlets (> 1.5 mm long) and large leaf-like bracts at the base of the inflorescence, and may one day be discovered in Michigan. MICHIGAN FLORA ONLINE. A. A. Reznicek, E. G. Voss, & B. S. Walters. February 2011. University of Michigan. Web. 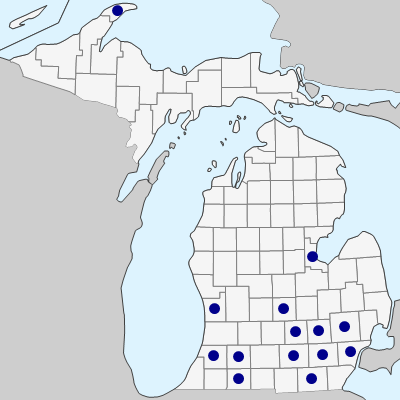 April 22, 2019. https://michiganflora.net/species.aspx?id=590.